Attached below is the review from Colin Seddon, a wildlife rescue expert in UK, which was published by BBC Wildlife Magazine. Our purpose in republishing the book electronically is to raise funds to support our non-profit, Campaign against Canned Hunting (CACH). 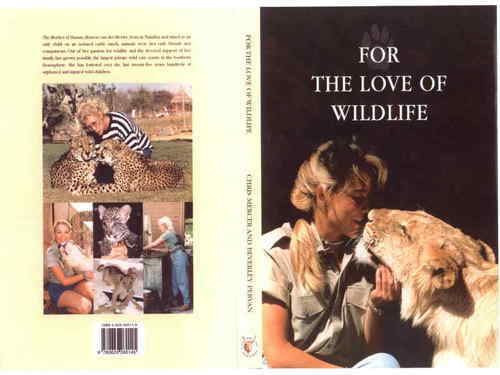 1.support the Campaign by checking out the book’s website, http://fortheloveofwildlife.com, and buying the book. 2.spread the word through their own social networks to encourage their family and friends to do the same. Any help that you can give us will go straight to the cause of animal welfare and you know how badly this is needed in South Africa. We’d be delighted to offer a note of thanks and a link to your site on fortheloveofwildlife.com in return. This book relates the working history of the Harnas Lion Farm in Namibia and the personal history of its founder, Marieta van der Merwe and her family. The book is characterised by an authenticity apparent to anyone who has worked in animal rescue centres – especially those continually struggling for funding. The authors – themselves founders and managers of a wildlife rehab centre in the Kalahari – make no attempt to paint a rosy picture of wildlife rehabilitation, detailing mistakes made, organisational short comings, the value of volunteers and the chaotic nature of sanctuary life. Dotted throughout is information about animal behaviour, the nature of the Kalahari desert and the appalling lack of rights afforded to wild animals in Southern Africa. This absorbing book is at times moving, depressing, amusing, informative and uplifting. Working with wildlife is not all fun, it makes clear, but if you want to know how it really is – warts and all – then this is the book for you.